I met Paul DeMuro just outside the N train at the 59th St station last fall. 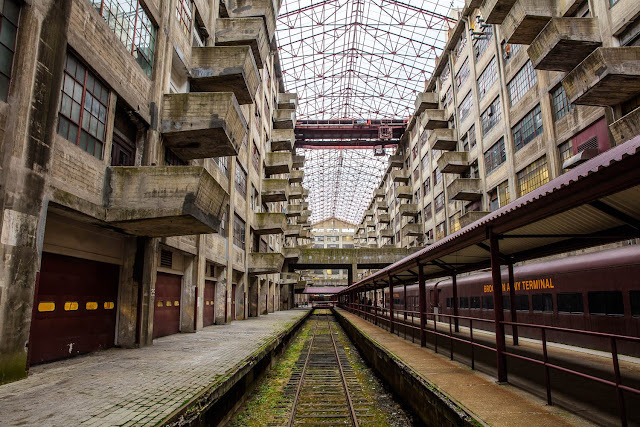 His studio is located deep within the historical Brooklyn Army Terminal. We stopped in to see the desolate, but grandiose railroad tracks on our way. The heavy cement balconies that diagonally line its walls and the massive atrium towering above it astonished me as much as the fact that I had no idea this place existed. Block-long superstructures with slits for windows were connected by a footbridge similar to an ancient aqueduct. The whole compound seemed like a set for a sci-fi movie. But it was no surprise that the real marvel came when we finally got up to Paul's studio. 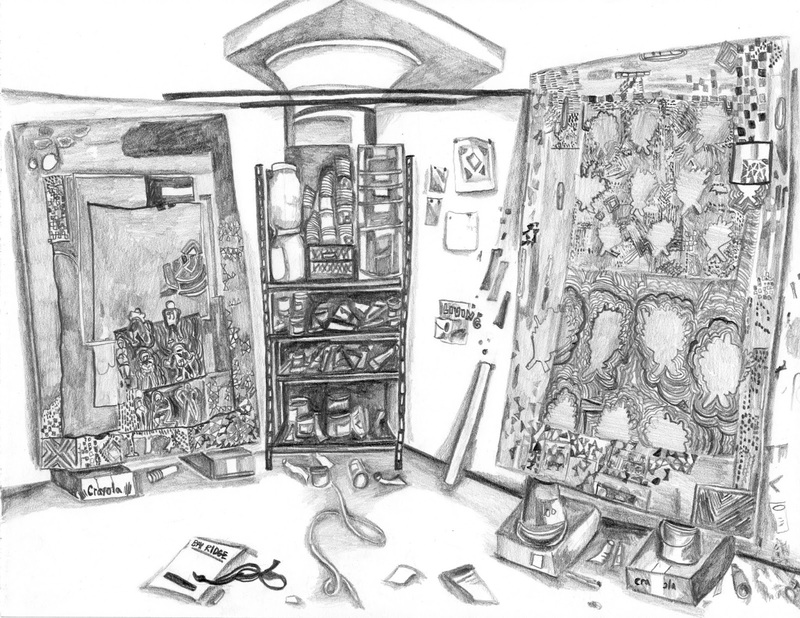 The space positively glowed from the new suite of paintings he was working on. The love was instant. I remember growing crystals when I was young. I think the recipe went like this: fill a jar with very salty water, attach a string across the top of it, and put it in the sunlight. They took time, but in the early 80's I had a lot of that. Using patience, sensitivity to light and a powerful center of intuition, DeMuro has been growing something even more astonishing in his studio. 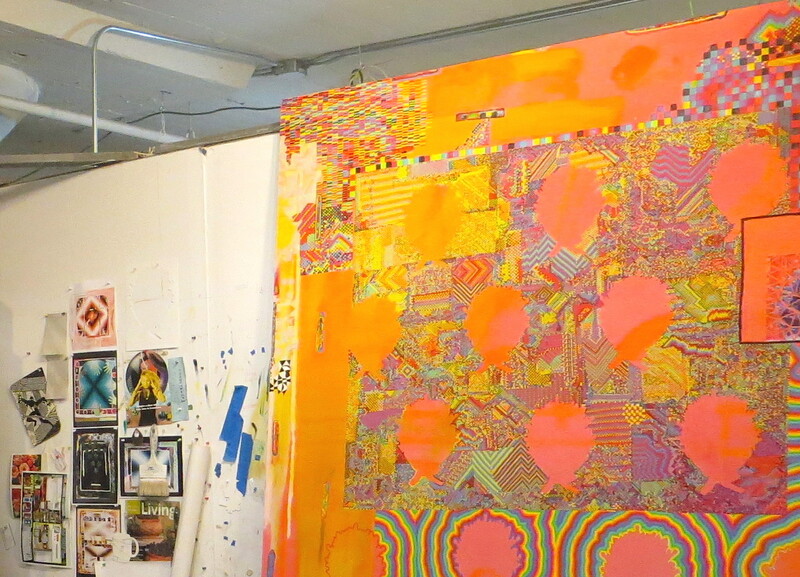 Three massive paintings were slowly being consumed by clusters of pattern and color, and I was there to watch it. Chaotic phenomena came sailing out of DeMuro's hand hour after hour. His palettes refract light like air on water. It was easy to relate his wildy trippy networks of mark-making to those found in crystalline structures. DeMuro explained that he works on his paintings instinctively, that each section informs the next. He also collages images like his sister playing football or the outline of a bouquet of flowers onto the paintings in order to get the ball rolling. Gradients and rainbows radiate from the collages' centers illuminating them like the sound of a gospel choir during the chorus of a pop song. I have yet to see these paintings in their completed form, but I can only imagine they have the same healing power that crystals and choirs do.